With 10,000+ stores in 27 countries, discount giant Lidl has its sights set on joining fellow German-based global discounter Aldi with a presence in the US market. Much like Aldi, Lidl is known across Europe and beyond for its streamlined no-frills, low-cost, quality own-brand approach to the grocery business. For its part, Aldi anticipates adding more than 400 new stores to its already-substantial US presence over the next few years. Source: Chain Store Guide’s Database of Supermarket, Grocery and Convenience Store Chains. *CSG Projection. Estimated growth is based on proprietary trend analysis and company comments. Actual figures are subject to change. This data is not intended for investment decisions. Lidl has quietly established an East Coast infrastructure over the last 18 months as it works towards its goal of opening its first US stores by 2018. Beyond its target of 2018 and initial East Coast focus, the company has kept details close to the vest. Last summer, company officials announced the opening of its US headquarters in the greater Washington, DC area and the location of a Fredericksburg, VA distribution facility. 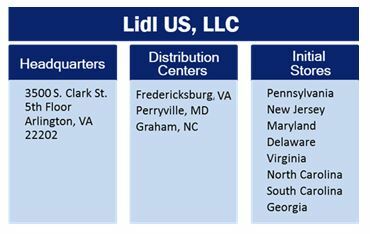 Lidl has since announced two additional distribution facilities (see the graphic below). Speculation and local reports as to specific cities and site locations, along with the timing of the openings, have picked up in recent weeks as Lidl increasingly engages with local real estate representatives and planning entities. At this point in time, Chain Store Guide agrees with the observers who estimate that Lidl will open 100 to 150 stores in quick succession in early to mid-2018. The average store footprint is anticipated to be 35,000 square feet, larger than US Aldi stores. The level of disruption associated with Lidl’s entry into the market will be commented upon and is open to debate. It hinges upon a couple of factors, the first of which is Aldi’s ability to execute its plan to reach the 2,000-store mark by 2018. Chain Store Guide anticipates Aldi will close a busy 2016 with more than 1,600 stores, becoming the third largest supermarket chain in the country by store count, and reach its 2018 goal of 2,000 stores. Aldi has proven the appeal of the Aldi/Lidl model, a model that will be that much more of a force when Lidl enters the market in 2018. 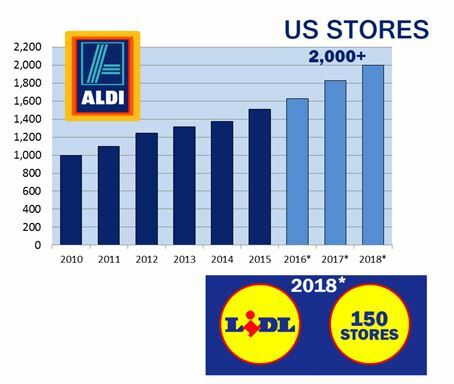 It’s the combined presence of both Lidl and Aldi that will cause waves, initially in markets along the East Coast, and especially if Lidl can quickly match Aldi store-for-store in these areas. Doing so could generate a environment similar to the one found in the UK in which the big four supermarkets (Tesco, ASDA, Sainsbury’s and Morrisons) have attempted to compete on a price basis with Aldi and Lidl only to cede market share and struggle to meet revenue targets as a result.